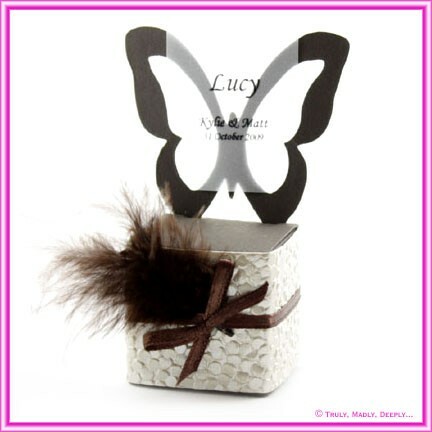 Stunning genuine Paperglitz butterfly shaped chair boxes! 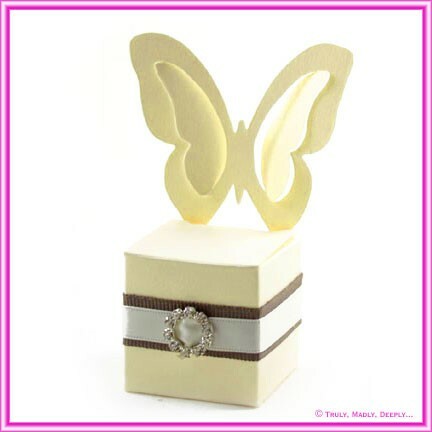 These gorgeous little boxes have a 4cm cube base and a butterfly shaped chair backing - perfect for weddings, christenings, birthdays & more! Can be used as a place card as well! Use the free template below and you can insert a small a name tag if you wish (sold separately). The wings of the butterfly can be shown in two different formats. The inner wings can be removed or you can gently twist them inwards to create a double wing effect. Beautiful enough to use as is, or decorate it until you heart is content. This bomboniere box holds 5 of our foil wrapped chocolate hearts or 9 of our sugar coated almonds. Alternatively, this box will also hold 1 x chocolate heart & the traditional 5 x sugar coated almonds! This stunning thick 360gsm bright white uncoated matte card stock is blended with real cotton for a beautifully soft touch finish. With 20% recycled content, 15% pure cotton & FSC certification, it has the environmental credentials to match its good looks. 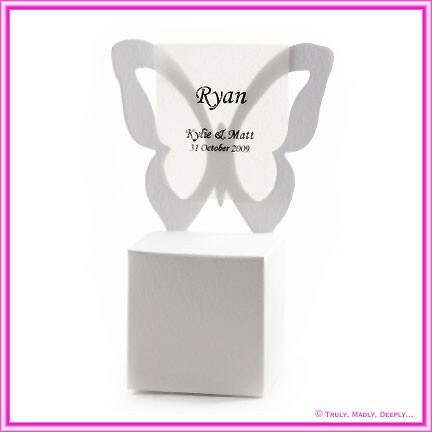 The box has a 40mm cube base and the butterfly backing stands 9.9cm tall and arrives flat packed for easily assembly - no glues required, just a few simple folds - break all folds, fold the base flaps in and lock the side tab - takes less than 20 seconds! It is manufactured in Italy and is converted and packaged by Paperglitz in Sydney, Australia. This range of papers is both inkjet & laser compatible* however, given its weight, bulk & stiffness of this stock, prior testing it strongly recommended as most digital printers can't handle it. With it's cotton blend it is also ideal for letterpress & embossing. *Compatible is not a guarantee of performance on your specific printer. It has been tested to work with a wide range of such printers/toners but it always subject to machine type and specification. Prior testing is recommended - particular with this stock as it is both thick & stiff. Use as a place card holder as well. 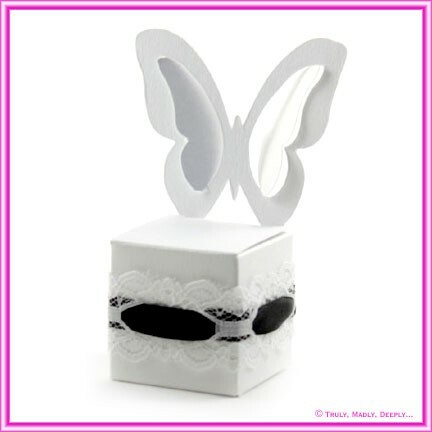 You can print directly on the box or use a name tag that is simply printed on to translucent paper (sold separately), trimmed to size and slides into the wings of the butterfly. The translucent is optional and sold separately. 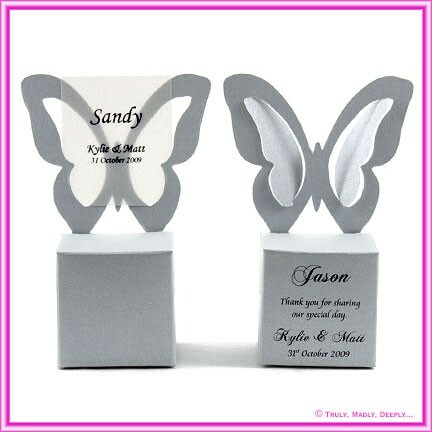 On the pictured boxes we have used Clear Translucent or Iridescent Pearl White Translucent. If you would like to use name tags, you can download a free MS Word template below and click here to purchase your translucent paper. If you would prefer to print on the sides or lid of the box, this can be done before separating the box from it's sheet and you can use a free MS Word template for this below. Note : We do recommend test printing first. There is no guarantee that your printer can print on these without damaging the box. We have tested on a couple of different printers and they worked just fine. If you have difficulty printing, contact us to obtain a quote for us to print them for you. Other box sizes such as 5cm cubes, 3 Chocolate boxes, cake boxes & chair boxes are also available. We also carry this colour in A4, A3 & SRA3 sheets as well as a wide range of die cut DIY invitation cards. This is Genuine Cottonesse™ card stock from Italy - not a cheap Chinese flimsy printed white copy. The price is for a single box only, regardless of how many are pictured and any name tags, chocolates, printing or decorations such as ribbons and flowers are sold separately.